1. Make the Belle and Boo decoupage and set to one side. 2. Cut a piece of red floral backing paper 14.5 x 14.5cm, adhere to the card blank. 3. Trim a piece of the pink graph paper 8x13cm; adhere to the left side of the card blank. 4. Cut a piece of retro floral paper 12x12cm and adhere to the card blank at an angle. 5. Die cut the scalloped strip twice using pink graph paper and adhere to the card, cutting to fit. The decoupage will cover the join. 6. Punch 2 clouds from green polka paper and fix to the top left side of the card. 7. Add the decoupage, making sure it covers the scalloped strip joints. 8. Add the wooden rabbit to the right side and a bow to the left. 1. Once you have selected your design don’t release all the pieces from the sheet, its best to keep them in one place until needed so you don’t forget what piece is from what layer. 2. 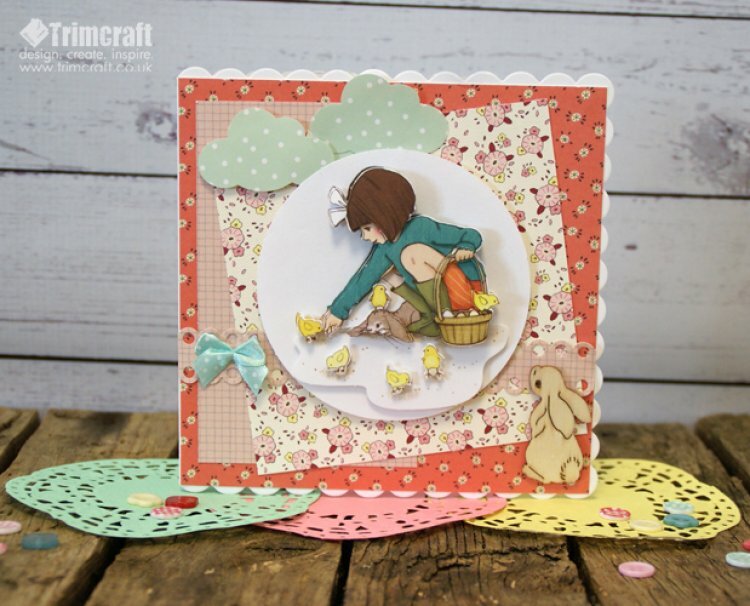 Have fun mixing up your designs, try missing off the large first layer to create a 3D embellishment; you can then use the single first layer as a card topper at a later date. 3. For areas too small for foam squares try using silicon glue applied with a cocktail stick, this will allow you to glue smaller areas. 4. If you are posting your cards, don’t add too many layers as the cost of postage will increase. 5. Use shaping tools to add dimension to your images, especially great for floral images, this will make them stand out and not look so flat. Do you love to decoupage? Let us know your top tips for decoupage below and don’t forget to share your projects with us in the Project gallery.